Till now, in Anaisha’a journey to NY, we have seen her getting prepared to be off. What happens next? It is 4 in the morning, and the cab guy has arrived. Karan, Aniasha’s FRIEND, and she get ready to start for the airport now. They hug tightly, and after a real long kiss and a smooch which could not get any wilder, karan took the bags in his hands. “Ah! I so wish I could lift her rather”, Karan thinks within himself. Peskina, is also there in her cab. Ready to go. They dump it all in the rear of the car, and sit comfortably holding each others hand, in the overtly built Qualis. A quails was necessary to hold that entire luggage. She takes comforts resting her head on his chest, and they talk again about the long gap of three months. They have been talking only about this single topic all evening and night now. They reach the airport at 5, and it seems like it is just 5 minutes back that they had started from their homes. Yes, the airport, which is a good 30 KM from the city, seems near now. After getting the entire luggage on the trolley, and a parting hug and a kiss without giving a hoot to PDA, and the curious looking gaping early morning travelers, they part. Karan probably thanks that it is time, and he can now rest to sleep finally after the long sleepless night. He gets back into the same cab immediately and is off home. Anaisha, trying to hide her moist eyes from Peskina, who by now is standing next to her in the entrance queue, holds her trolley. She gets her entire house( which has been packed in those huge bags) screened at the x-ray counters. 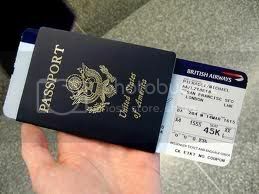 She proudly hands over her british airways ticket to the ticket counter lady, and gets herself a boarding pass with BRITISH airways prominently written on it, besides her name. She is proud. Those moisty eyes were now confusing – sad, happy or just sleepy? She then heads to the immigration counter, proudly still holding the boarding pass, and thinking of the nice days ahead in New York. She then hands over the immigration form to the officer there, along with her American passport. Anaisha was born in America, and lived a considerable part of her younger days in the US, thus the American passport. She has a dual citizenship. “Ma’am. You can go to the “some” office today, and come back tomorrow for the flight”, and carries on with his work. “NO, Ma’am. I am very serious”, he replies with a firm tone this time looking straight into her eyes. He takes her boarding pass, which she has been holding so carefully till now, and scribbles there in bold words – OFF LOADED!. She just could not bear that sight. More than anything, I guess the fact that her good looking boarding pass getting smeared was troubling her the most. She was nearly into tears, when the Airline ground staff come to her rescue. “We are sorry. You can come back tomorrow ma’am”. Her colleagues, 6 in number, all bid her bye and get off from her sight with their equally huge hand bags. Anaisha is there at the airport, all there, alone. Flashes of the previous night come across her mind. “NO. I don’t want to go. I don’t want to be away from you”, She hugs him tighter. Little did she know, or desired, that God was listening to her then, and was in a Dabbang mood to be granting her verbal wish. It is 8:30 AM, and she has been at the airport for a good 3 hours now, and there is no jugaad that seems to be possible. No other option, but just to get back home, and see what can be done in that “some” office. He does not answer. She tries again, he still does not answer the call. After a couple more tries, to the extent, that the telecom authorities might actually consider levying charges on missed calls, she stops calling. “He must be sleeping”, the caring girl in her tells herself. She waits for an hour there at the airport, hoping for some divine intervention. Nothing happens. Not even the expected call from Karan. She, without an option, takes a cab, and heads back to the city. All her dreams and thought of the good times ahead are dead for the near future. All that she is left with is her british Airways boarding pass with huge scribbling on it – OFFLOADED! waise apne apna dimaaag kuch jyada nai laga liya yahn pe? @ Neha: dimaag lagana.. this is the story as told to me in verbatim. I just put it in words. @ Anaisha: the protaganist in my story.. it is jus as told to me!! !